Is Baby’s Night Waking from Hunger? Is Baby’s Night Waking from Hunger? Or is baby just feeling hungry after waking up? Around here, Sesame Street comes on at 6 AM. He never sees this show for obvious reasons, so I thought I’d turn it on and he would be enthralled and let me sleep. I turned it on and went to my bed. As I got in bed, I was suddenly starving. I was surprised at how hungry I was. I had eaten normally the day before. I am not pregnant and not nursing–no “growth spurt” for me. It was odd to me that I would be so hungry over an hour before my usual breakfast time. (By the way, in case you are wondering, my Sesame Street idea didn’t work too well. Brayden is not long distracted by the TV and was in my room within 15 minutes, at which time I just got up). That experience helped me really understand how sometimes a baby could just wake up and be starving in the middle of the night when he usually can make it through without a problem. 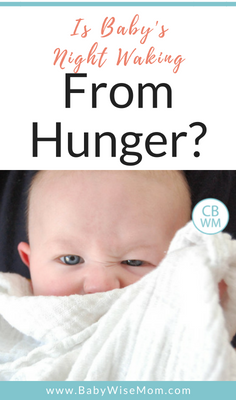 If an adult who isn’t growing or producing anything and has been eating normally can wake up and be hungry, then certainly a quickly growing baby can do the same. 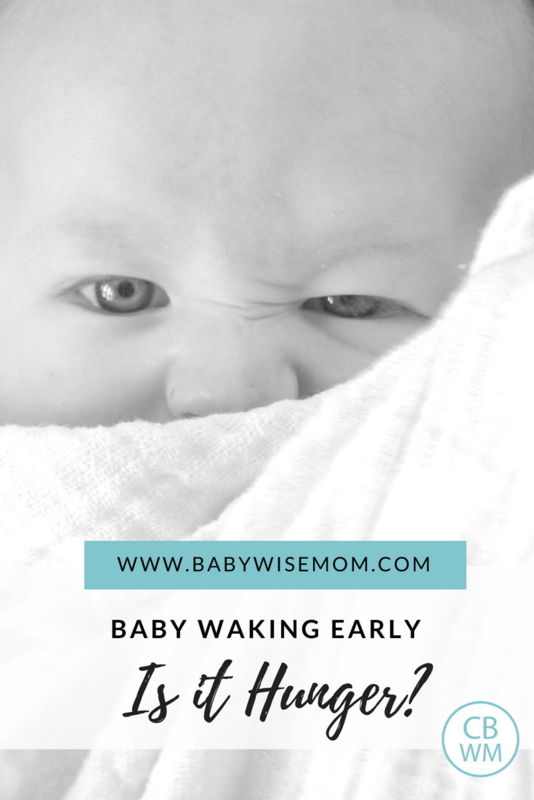 So when your baby has times of waking in the night, be aware of that possibility, and while it isn’t necessarily “typical” it also isn’t necessarily “odd.” I didn’t wake up because of hunger, but once I was up, I got hungry. So when you are solving nighttime sleep issues, keep that in mind. Your baby will likely take a full feeding if he hasn’t eaten in 9 hours, but it doesn’t necessarily mean hunger is what woke him up. I am always saying to feed a hungry baby, and I certainly am not saying to not feed your baby if he needs it in the night. There is a great method for testing hunger a friend of mine came up with. She will sooth her baby to sleep if she wakes and won’t go back to sleep. If her baby goes back to sleep and stays asleep until waketime, then she can safely assume it wasn’t a hunger issue. If the baby goes back to sleep but wakes again in the night, then there is a good chance it is because of hunger. Also, if the baby simply won’t go back to sleep even with help, then she assumes it is hunger. Take note that she doesn’t sooth over and over; just the first time the waking is random. This helps her more quickly asses the reason for waking. I’ve been following your blog for a while now and always reference it first when I have a scheduling question or what not. Thank you for all of the info you provide. It is a wonderful help for me and my little ones! That is quite the group you have there 🙂 I am glad to help! Thanks for the thanks! This might be a really stupid question, but do babies “root” even when they are not hungry? My baby seems to root for the breast every time I (or anyone else) picks her up. I have a six month old and have been doing babywise from birth. he has never slept through the night however would go back to sleep after a feed. lately at around 1am he wakes and wont go back to sleep for an hour or so which is getting very tiring. We change nappy , check temp of room, feed . his shedule during day is 7am 60mls formula. the 2 tbs cereal with 60mls of milk (thats the only way i can get more milk into him.1130 60 mls , sweet potato with 60mls of milk.330 60 mls, carrot with 60 mls of milk7pm 100mls1030pm dream feed 120mlshe will not drink the milk if i stick to a 3 hour schedule he refuses it and cries.plss hellp!!!! Jennie and Ella’s mom, I apologize–I just now saw the questions you asked in October! Dusty, is he able to self-soothe? Have you trained him to sleep on his own? If not, that would be my first recommendation. It sounds like that is the most likely problem. In your day, I would try to eat at 7, 11 rather than 11:30, 3 rather than 3:30, then 7–unless you know he won’t do it any other way. My LO is 16 weeks old but was born 6 weeks early (corrected age is 10 wk). He was healthy just tiny at birth but is now in the 50% for size. I have him on a eat-play-sleep schedule which works well, but he still wakes every 3 hours throughout the night, starving!Here's our typical day:8am: First feeding of the day – BF11am: BF2pm: BF4pm: BF6pm: BF8pm: Bottle Feed — 5oz BM w/ 2tsp cereal11pm: Sometimes wakes up on his own, sometimes DF, sometimes let him sleep through1am: Wakes up starving, eats 5oz BM3am: Wakes up, cannot be soothed, nurses for 10min5:50/6am: Wakes up crying, sometimes can be soothed w/ paci, sometimes eats full bottle.We've tried to dreamfeed at 11pm, but he still wakes up at 1 or 2 am. I have tried CIO but he cried for 2 hours straight for several nights, to the point where he was hyperventilating & sweating. If he wasn't hungry initially, after screaming for 2 hours, he was starving (for the record, I checked on him every 15 mins during the 2hour CIOs). I have noticed that no matter what time we give him his last feeding or DF, he awakens around 1 or 2am, ready to eat. The longest he's ever slept is 5 hours, which was from 8pm to 1am. Even though he was a preemie, he's average in size. My question: How can I progress towards having him STTN? Is he waking out of habit or hunger? 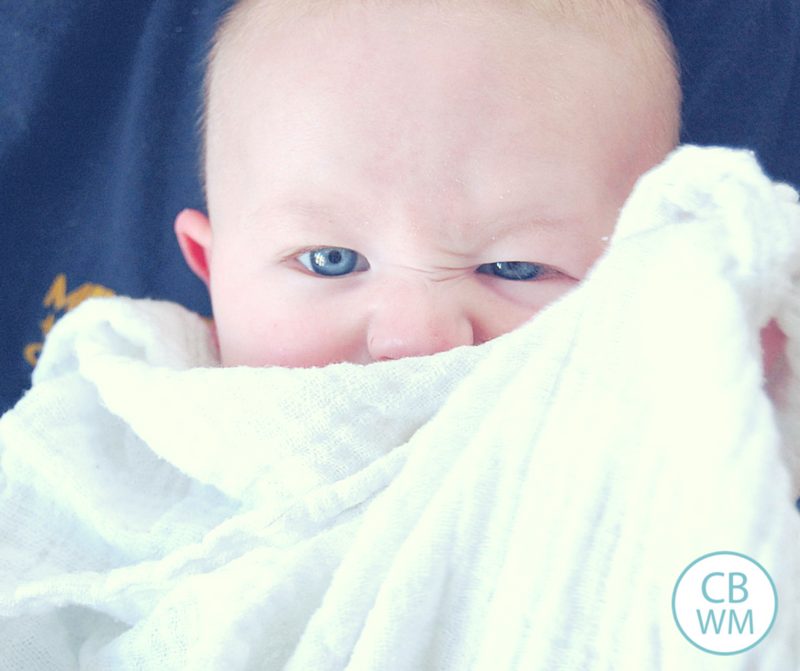 Since he is hysterical/sweating through his sleeper & swaddle, is it safe/effective to do CIO? Any advise would be greatly appreciated! Thanks! Missy, having a range of an hour with him waking would mean he isn't waking from habit but from need. BW says a digital clock will tell you if baby is waking from habit. I have always taken that to mean it is habit if it is basically down to the minute.Since he is waking from need, you really have two options: 1-try to fill that need in the day if possible or 2-wait until the need is gone.Be sure that during the day, he is able to soothe himself to sleep so that when the need for food is gone in the night, he won't be crying in a need for help falling back asleep. Good luck! Hi! I used your blog a ton for first kiddo and now again for second. Thanks =) So our 'lil guy is 2 1/2 wks and goes 3 hrs consistently during day – sometimes 2 1/2 as night approaches. He's waking after dream feed after only 1 1/2 hrs and then will eat less than 2 hrs until his bottle around 5:30 and then goes until his morning bottle (7-7:30a). He's getting plenty of feedings during day. I even tried moving back to 2.5 hrs and that didn't make difference. He does not burp at night – despite our efforts – and last night pretty much snack fed – he'd eat 1.5 oz and then be done. He's one if you don't get burp – he's done eating, too. I wonder if it's too early to know if it's truly hunger or if I should try soothing him back to sleep for a bit. He's rooting like crazy and appears ravenous. Any suggestions appreciated! I am at a loss with my 7 month old. She was a great sleeper at night as a newborn as was STTN by 3 months old. Not long after she turned 4 months old she started waking around 5:00 or 5:30 to eat instead of her 7:00 am wake time. At first I tried treating it like a hunger issue and fed her and immediately put her back down again. Unfortunately it hasn't stopped and I noticed that on most days she seems to stretch out one or two feedings during the day so she ultimately isn't getting an extra feeding in with the early morning feeding in. This has resulted in me deciding to trying to wean her off of it but since that time she has started waking up multiple times at night. Before if she woke in that night she would fuss for a bit and then fall back asleep or we could move her to her swing. Now when she wakes she immediately starts crying and can't even be soothed to sleep in her swing. The times she wakes up is so sporadic also. If she wakes up as early at midnight or 1:00, she still wakes for the 4:30-5:30 feeding. We started solids about a month ago hoping it would help and so far no sleep for us. This is her current routine:6:55-7:30 Wake, nurse, and solids9:10 nap11:00 wake, nurse, solids12:40 nap3:00 wake, nurse4:40 nap5:30-5:45 wake, nurse, solids7:00-7:30 pjs, nurse, and in bedShe wakes on average 2x a night. The first feeding varies. Sometimes it is a midnight, 1:30, 2:00, 2:45, 3:00 and then the second feeding is between 4:30 and 5:30. I am at a loss at what to do and I need sleep.